The United Shipbuilding Corporation (USC) is looking for money that was allocated to complete the Nerpa nuclear submarine for India’s Navy. Approximately $15.9 million transferred by the Russian state arms exporter Rosoboronexport for the completion of the Nerpa nuclear submarine allegedly disappeared, the Kommersant business daily reported on May 24. 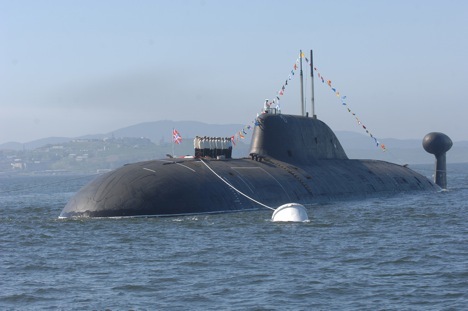 According to the Kommersant newspaper’s reports, the Russian state arms exporter issued a $31.8 million loan to the Far East Centre of Shipbuilding and Ship Repair to finish the construction of the nuclear submarine for the Indian Navy. The loss was revealed in the process of an internal audit at the centre held by its sole shareholder, United Shipbuilding Corporation (USC), Kommersant says. The Centre issued half of that amount to the contractor - the Amur shipyard but it’s unclear how the situation unfolded further on. USC has applied to the Russian Audit Chamber asking to look into the case. An Audit Chamber source who spoke with Kommersant confirmed that an investigation into the matter is being conducted. It should be mentioned that the USC was criticised for the state of the Far-Eastern shipbuilding assets in mid-April by the Deputy Prime Minister Dmitry Rogozin who supervises the industry. As a result, Andrey Dyachkov, head of the United Shipbuilding Corporation, resigned, and recently Vladimir Shmakov, the “Uralvagonzavod” company representative, became new head of the USC. This subject is expected to be discussed at Mr Rogozin’s conference where the heads of OSK and the biggest shipbuilding companies are invited. In 2012, Russia gave the submarine out to the Indian Navy for a 10 year lease for $930 million. India provided its financial support to the shipyard to complete the project. Combined report is based on RAPSI, Kommersant and RIA Novosti.